Guild Wars 2 is poised to make its return to satisfy it fans and those who enjoy a good MMORPG. On April 10th, ArenaNet and NCSoft will give you the opportunity to pre-order one of three version of Guild Wars 2. There's the Standard Edition, the Digital Deluxe Edition and the Collector's Edition. The latter being the reason we're all here as it offers quite an assortment of goodies. Anyone who pre-orders any of these will be given access to all beta events until the games release and access to the game 3 days before anyone else. The Collectors Edition comes bundled with a hand-painted 25 centimeter statue of the warrior Rytiock Brimstone with flaming sword. Included is a 118-page hardbound making-of book, a collector's tin, a CD of the games soundtrack and a custom frame and five art prints from Guild Wars 2. Both the Collector's and Digital Deluxe Editions come with five in-game items. 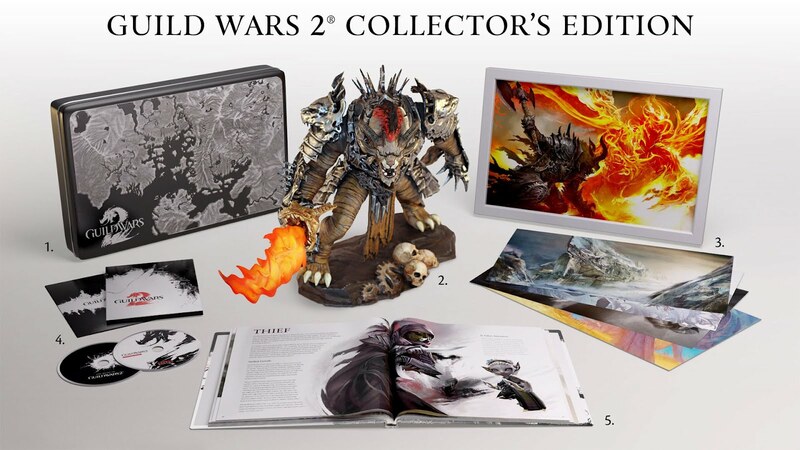 The Guild Wars 2 Collector's Edition will retail at $150, the Digital Deluxe at $69.99 and the Standard Edition at $49.99. No official date for the game has been announced yet.